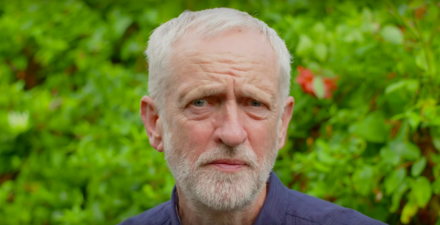 In a new video released today, Jeremy Corbyn has pledged to drive antisemitism out of the Labour Party “for good” and apologised for “the hurt caused to many Jewish people”. The video, which has been released on social media and sent to all Labour members by email, shows the Labour leader directly addressing supporters of the party. Corbyn said: “I have spent my life campaigning for a multicultural society and building recognition of the strength of our diversity. “Jewish people have been at the heard of our party and our movement throughout our history. No one should dismiss the concerns they’ve expressed about what’s been happening in the party. The party that I am proud to lead. “Driving antisemitism out of the party for good, and working with the Jewish community to rebuild trust, are vital priorities. I’m sorry for the hurt caused to many Jewish people. “We have been too slow in processing disciplinary cases of mostly online antisemitic abuse by party members. We’re acting to speed this process up. “People who hold antisemitic views have no place in the Labour Party. They may be few: the number of cases over the past three years represents less than 0.1 per cent of Labour’s membership of more than half a million. But one is too many. “Our party must never be a home for such people, and never will be. People who use antisemitic poison need to understand: you do not do it in my name, or the name of my party. You are not our supporters. “And anyone who denies that this has surfaced within our party is clearly actually wrong and contributing to the problem. I want to make it clear that any government I lead will take whatever measures necessary to support and guarantee the security of all Jewish communities and their culture. The video was rumoured to be expected on Friday, but instead the Labour leader that evening wrote a piece for The Guardian. In the op-ed, Corbyn hit back at claims made in a joint editorial of three Jewish newspapers that a Labour government under his leadership would present an “existential threat” to Jewish life in Britain. The Labour leader said “I do not for one moment accept that”, calling it “overheated rhetoric”. But Corbyn did go on to acknowledge that the party had been “too slow” in dealing with disciplinary cases involving antisemitism and that further political education of members was needed. He proceeded to explicitly disavow those with antisemitic views. “People who dish out antisemitic poison need to understand: you do not do it in my name,” wrote the Labour leader. Corbyn also recognised that “most” of the Jewish community were not satisfied with Labour’s new code of conduct and did not agree that the full International Holocaust Remembrance Alliance (IHRA) definition of antisemitism including examples had been incorporated. He said there should been more consultation “at an earlier stage”. However, Corbyn did not go so far as to declare that the most disputed example of antisemitism – claiming the state of Israel is a “racist endeavour” – should be adopted. It is this particular example that is widely seen as the sticking point. Journalists remarked that parts of the Guardian article were identical to the one published by the Evening Standard in April. The timing of the piece was also criticised. It was pointed out that many Jewish activists and commentators would be restricted in their ability to respond as it was published shortly before the start of Shabbat. The Jewish Leadership Council and the Board of Deputies of British Jews published a full response to Corbyn’s piece after Shabbat on Saturday evening. Describing it as “ill-timed and ill-conceived”, the Jewish groups said Corbyn had opted to “lecture Jews on antisemitism”. The Jewish Labour Movement, Labour’s only formally affiliated Jewish group, also criticised Corbyn’s article as “bemoaning a situation of the party’s own making” and called for “action, not words”.